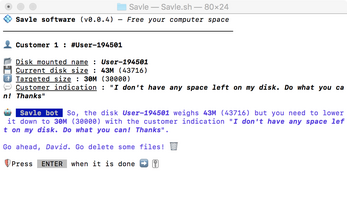 Savle is an experimental tiny text-based game with file system interactions. It is based on the idea of disk space, that we have to manage. 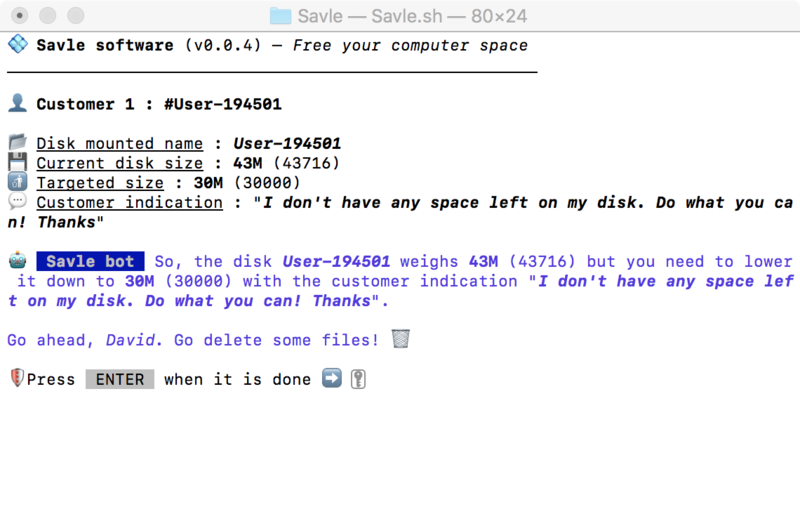 You will be playing an employee of Savle and will have to delete files (in real Windows/Mac/Linux file system) to free up space in customers disks. Warning : This game is made with a Shell (Bash) script. So the program can technically do what we want, including deleting files from your computer. But I testify on the honor that I never used "rm" (remove) function and even writing function. I guarantee that I only used read functions that are working only in the game folder. I also did not use any online function. The game files weigh +600Mo and that's normal. I did the game in Compo settings but have to use pictures, videos and music made earlier. All the files are self made, excepting the music files. To play the game, launch the script "Savle.sh"! Error "sleep: invalid time interval '0.5' or a lot of "??" appears : use "Savle-lite.sh"! It was running good on my Windows but you may need to install http://www.cygwin.com/ or Git (with sh.exe), or something else, if you can't launch the game.